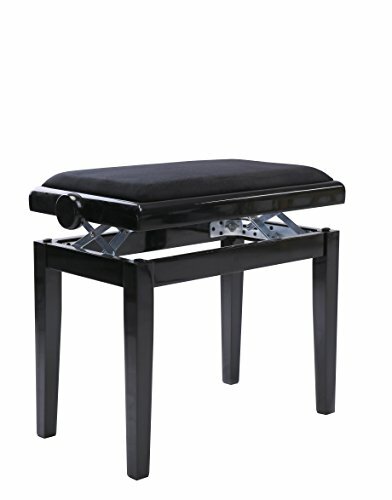 MYMQ 19" Bright Black Velvet Fabric Padded Adjustable Piano Bench is designed with a nicely crafted, solid wood frame and legs with black glossy finish that coordinates with any décor. This bench is 22'' long, 13.5'' deep and height can adjusted from 19'' to 22.5'' . It weighs about 15.2 pounds. The mechanism is strong and it is quiet and smooth when you adjust the height. This bench need a simple assembling that will only take you a few minutes. A wrench is the only tool required to attach the four legs, and it is included along with instructions at no extra cost. 22" long and 13 1/2" deep. Adjustable height from 19" to 22 1/2"
If you have any questions about this product by MYMQ, contact us by completing and submitting the form below. If you are looking for a specif part number, please include it with your message.